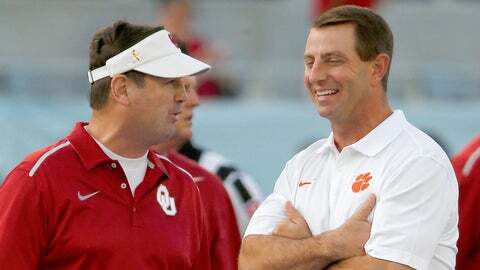 Bob Stoops, left, probably wasn't happy with the way last season ended at the hands of Dabo Swinney's Clemson squad. This year, he might get a chance to flip the script. The Pac-12 may not boast a playoff team this year but it’s not exactly lacking for depth. As many as 10 teams may get eligible by season’s end, and if only the champion (in the Rose Bowl) makes a New Year’s Six game, three of those 10 will have to find spots in non-Pac-12 bowls. Possibilities currently range from New York to Hawaii. All of the power conferences’ lower-tier bowls will be sweating out Selection Sunday. The Big 12 could earn as many as three or as few as one New Year’s Six spot. The Big Ten might get three. The ACC might get two. Whatever the case, the ripple effect will extend through the entire system. One bit of good news for bowl organizers: This week for the first time I projected there to be exactly enough six-win teams (80). But that includes quite a few teams that still have work to do – most notably 3-6 Kansas State. The Wildcats have yet to win a Big 12 game but close with 3-7 Iowa State, 0-10 Kansas and 5-4 West Virginia. The whole system is counting on you, Bill Snyder. Stewart Mandel is a senior college sports columnist for FOXSports.com. He covered college football and basketball for 15 years at Sports Illustrated. You can follow him on Twitter @slmandel and Facebook. Send emails and Mailbag questions to Stewart.Mandel@fox.com.